It is a spectacle known as Art on the Mart. 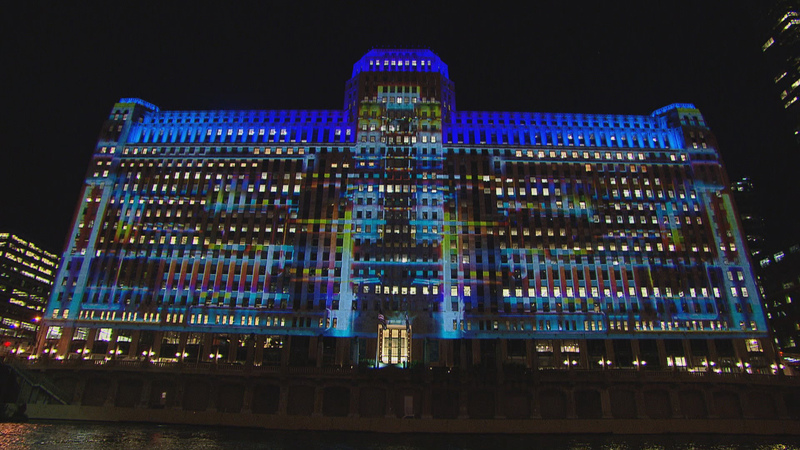 This weekend, the largest digital art projection in the world will be projected onto The Mart – what the Merchandise Mart is now called by its current owner. Chicago Tonight was there for an illuminating preview of a project that transforms the Chicago landmark into a canvas for light. Phil Ponce: It was the largest building in the world when it opened in 1930. Soon its famous facade will be on the receiving end of 34 projectors across the river that will transform it nightly into the latest addition to Chicago public art. Cynthia Noble, Art on the Mart: We see it as even more than an addition but really a transformation of what public art can be, because this is such a radically new and innovative platform. One of the things that distinguishes it is it’s incredible, incomparable scale. So the surface area, the projection area of the mart is over 2.5 acres, and so to help conceptualize that, that’s larger than two football fields. Ponce: We asked the digital team about the allure and challenge of working on this scale. Matty Dowlen, Obscura Digital: It’s working with the architecture of the building and finding a location to be able to project from that looks like it blends into the architecture and also gives you the amount of brightness that you’re trying to work with on the building, and also work with all of the texture and bring together everything into one cohesive piece. Ponce: The digital show for the media did not include the four artists – two from Chicago – whose work is soon to be projected. The art project is expected to be permanent and has a 30-year agreement with the city. Noble: It will be on view every Wednesday through Sunday, five nights a week, two hours each evening. The works will, after the launch, run on a kind of loop, and again, 10 months a year: March through December. Ponce: Art on the Mart is compliant with the Audubon Society and should not affect migratory birds. Also, it won’t be a billboard. Noble: We’re not thinking about this in terms of sponsorships or branding, in fact that’s baked right into our agreement and commitment with the city. This is an incredible philanthropic gift on the part of the Mart and its parent company, Vornado Realty Trust … so truly a gift of public art to the city. Dowlen: One of the things I think is important to look at when you’re looking at building projections is extending a canvas to the city. It’s a new piece of art that we can bring to the city of Chicago, as it’s known for its art. This is bringing a digital art piece to be able to showcase multiple types of artists, and to be able to showcase Chicago as an art center and have a digital canvas that can change every night. Noble: Chicago has this very long trajectory of public art and we’re delighted to bring this new milestone. Art on the Mart launches Saturday. If you are thinking of driving to the event, bear in mind that Wacker Drive will be open to pedestrians but shut down to traffic during the spectacle. Get more information about the event here.